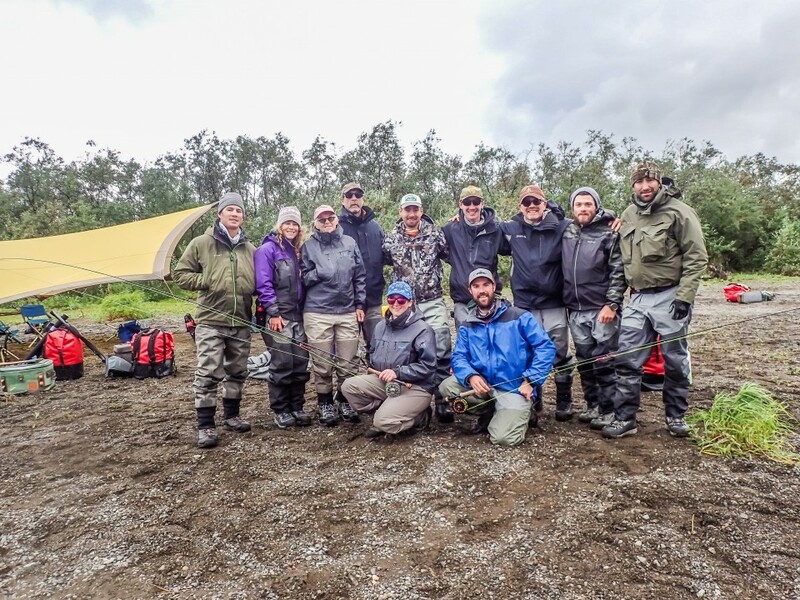 A group of experienced Bristol Bay anglers assembled in Dillingham for the “Season Finale” in the last week of August. Last week our challenge was getting everyone into Dillingham on the jet from Anchorage before the remnants of a tropical typhoon hit. This week, we were able to pick up all our guests on their scheduled flights but the luggage for Chuck, Andy, Ben and Carl was missing. We hoped it would arrive on the first flight tomorrow! We went through all our pre-trip briefings, shared a few cocktails and a big dinner. Everyone went to bed dreaming about our time on the river during peak Coho season and hopefully the arrival of the rest of the luggage. We awoke early and started out with a breakfast of eggs, bacon and English muffins as our fuel for a big day. As soon as the 8am flight arrived, we waited at the baggage claim, hoping that the bags had arrived. In no time we had everyone’s luggage and we were ready to start our journey. We checked in with our pilots. 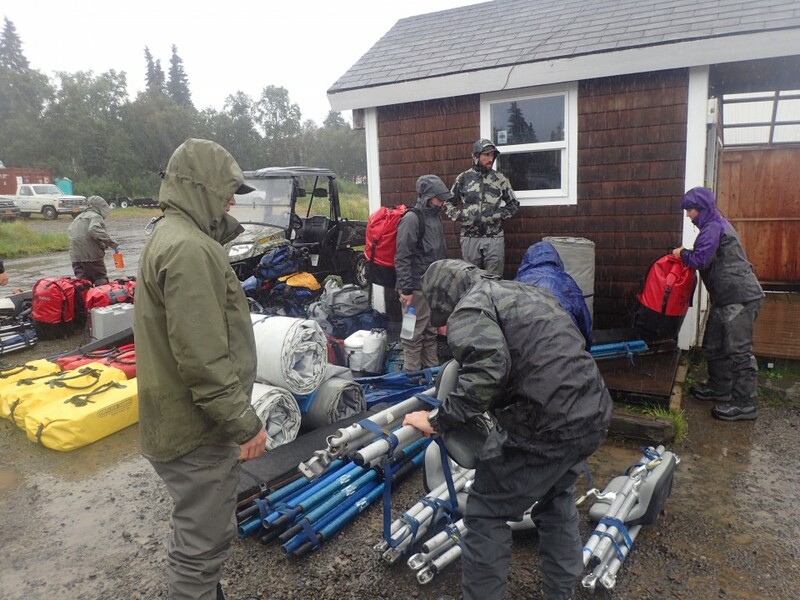 They had delayed our start due to weather and fog so we settled in and waited for their call before putting our waders on. The fog and winds were not friendly and it was looking like we may not make it out. We knew that if we took the 30-minute drive up to Lake Aleknagik we would be closer to our destination of Pegati Lake. We piled into the van and truck and caravanned up with the first two planeloads worth of gear with us in case the weather cleared. We also brought along cots so we would be able to set up a base of operations in the Rick’s hangar if the weather did not permit us to get out. The time came when our worries about not getting out turn into reality. 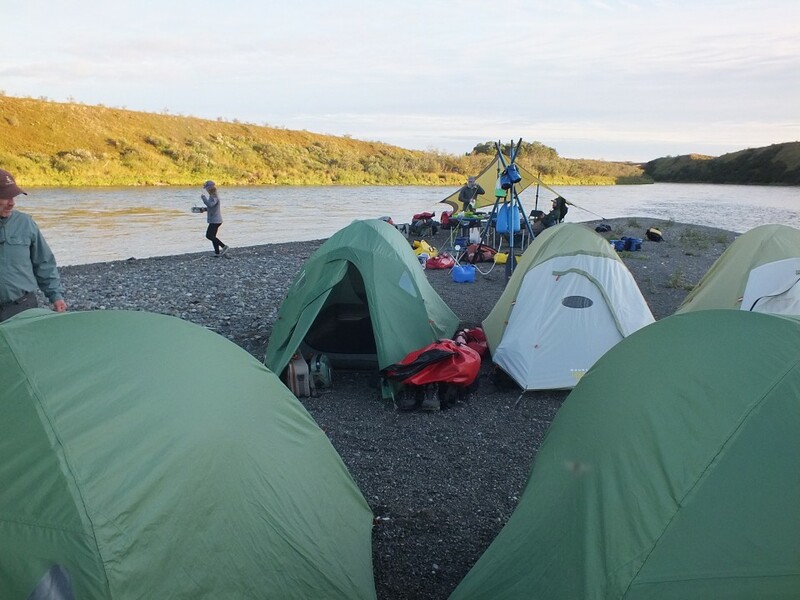 At that point, the cots were set up and guests settled in and then turned our attention to fishing. Rods were rigged and anglers headed to the Wood River. Chuck got on the scoreboard that evening with the First Coho of the trip. Most of the group lined up out on the dock for what became a beautiful night. 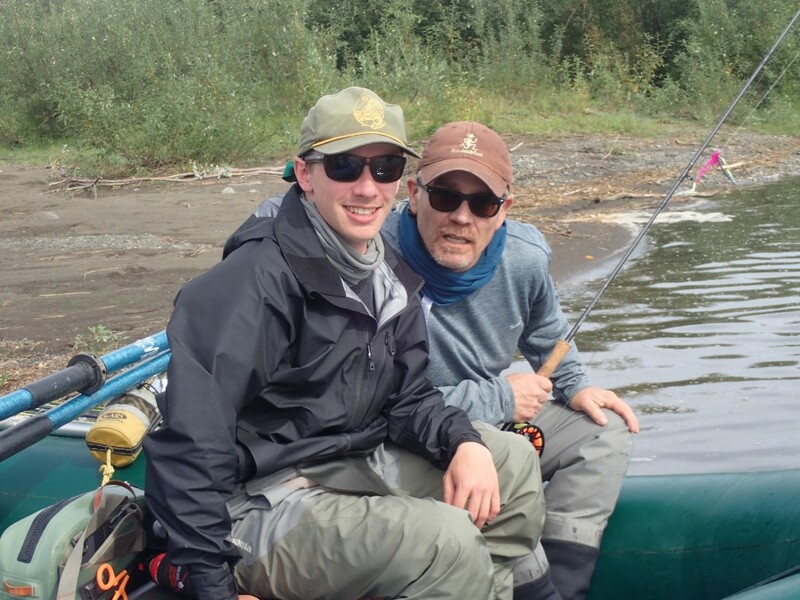 We all enjoyed being out there and the experience the magical therapy of fly-casting. The more experienced helped the less, and we all just enjoyed each other’s company with a lovely evening. Fingers were crossed as our eyes closed wondering what tomorrow would bring. The weather showed few signs of improvement when we woke up but we needed to stay positive and be at the ready in case our pilots wanted to take a shot at getting out. The planes from Mission Lodge across the lake sat at the dock and this was a sign that floatplanes in the region were not flying. 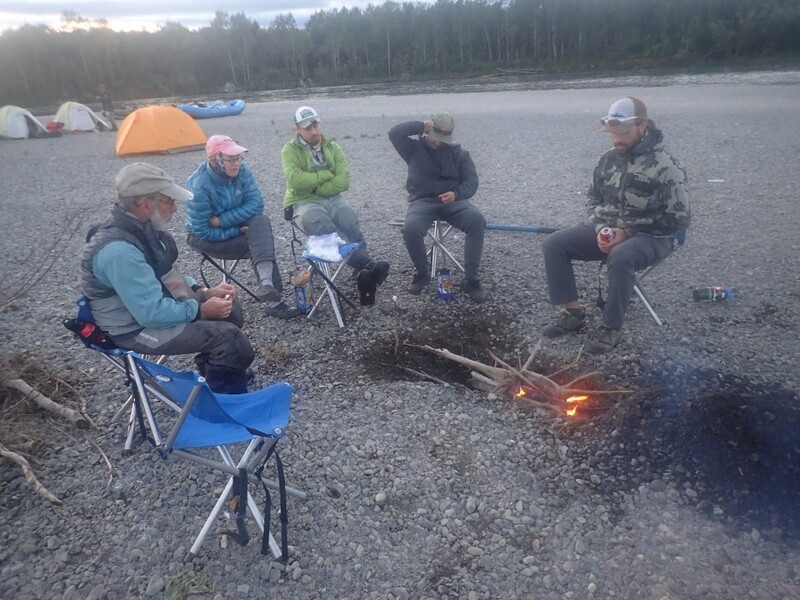 This was a group of experienced anglers and five out of the eight were returning guests. Although we all wanted to be on the river, everyone understood the challenges associated with bush travel. We needed to stay in a holding pattern but luckily we could still fish close by. We fished the bridge and the dock. Ben and Andy caught some nice Sockeye and Pinks from the bridge. For whatever reason, the day prior Andy had developed a reputation for hooking fish in the tail. This stayed with him throughout the course of the week and he got his fair share of heckling. When a fish was hooked someone would always yell out and question the location of the hook. We ate a late sandwich lunch and it started to dawn on us that we may not get out. Another local fishing mission began. Chuck was fishing accompanied by Brian. He hooked into a nice bright Coho that pulled line and flexed his rod before Brian put it in the net. We decided to keep this fish for dinner and Brian humanely put the fish down after giving it thanks. 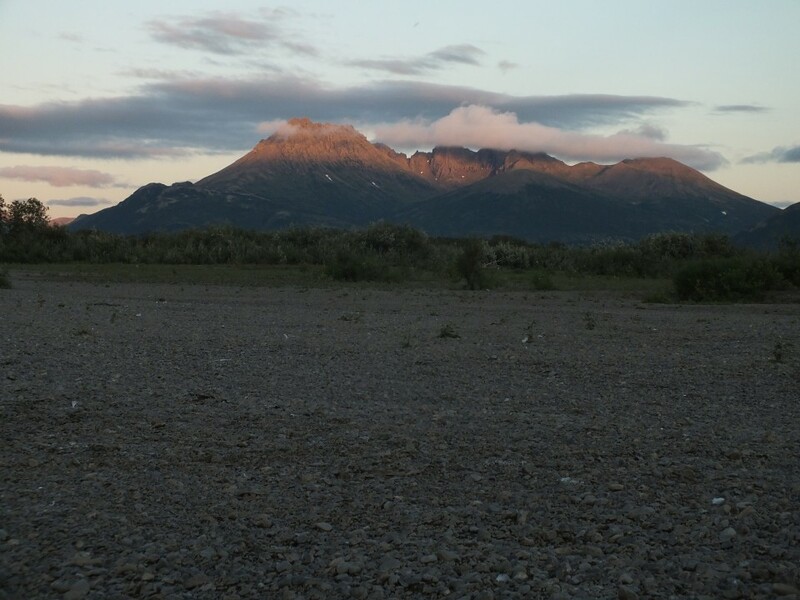 We shuttled anglers out to fish different parts of the Wood River. We saw thousands of fish spread across vast flats staging to spawn. It was truly an impressive site to behold. 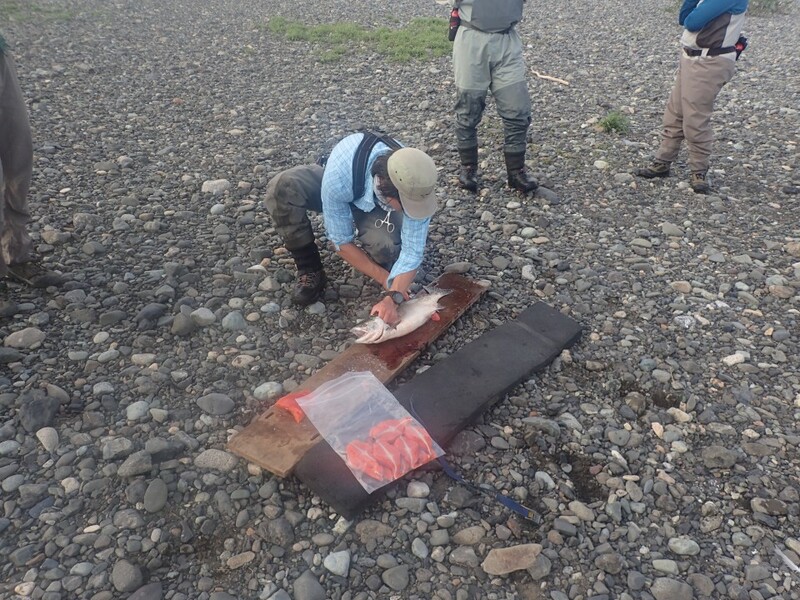 The Sockeye were crushing streamers and anglers were picking off Char with the bead as well. 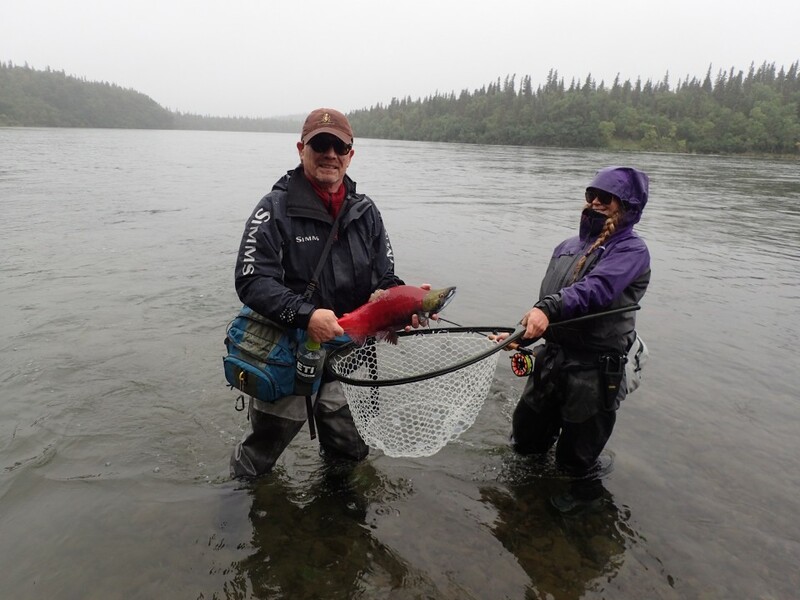 Ben and Christine started off throwing streamers and picking up some nice Sockeye. Pink Salmon were mixed in and willing to eat a fly. This was everyone’s first chance to get used to fighting powerful Salmon for the week. Brian filleted Chuck’s fish beautifully and we chowed down on some fresh caught Alaskan salmon. We once again hoped the weather gods would grant us with the opportunity for safe passage when we woke. Everyone piled onto their cots and went into slumber after a few beverages. We slept soundly. Heavy rain pelted down on the metal roof into the morning hours. We stayed hopeful that the weather would lift but it seemed Alaska had other plans. One of the debilitating factors of staying up at the lake is that cell phones carried by the guides have almost non-existent service. We had to rely on the weather reports that friends with Wi-Fi and our pilots gave us to figure out if a chance of same day departure existed. On this day, the heavy wind and rains gave us an inkling that we would not be getting out. 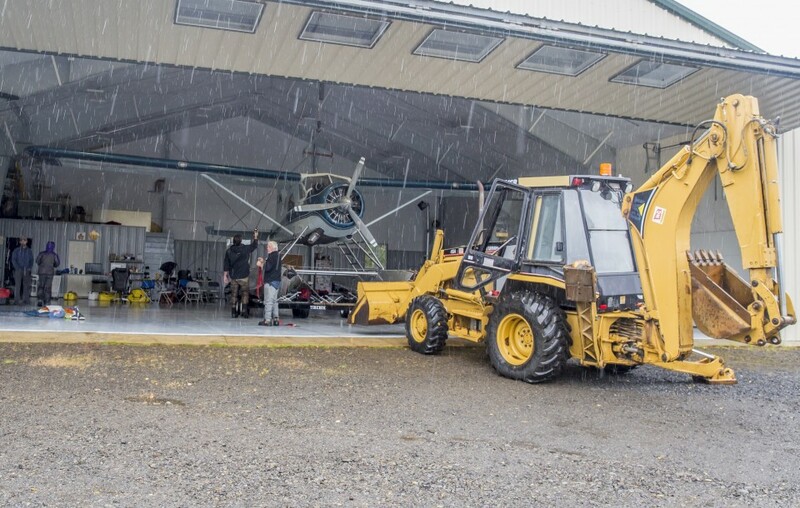 The real icing on the cake was that in the late morning Rick and Mike brought the Beaver in the hangar for service. This wasn’t the only icing served up this day. Wood River Market had a freshly baked batch of Cinnamon rolls that we all had to try. Some described them as the best cinnamon rolls they had ever had. With one of our primary aircraft for transport in for service, we had a pretty good idea that the weather today was not going to be flyable. Everyone was bummed to see our Beaver in the hangar with us, but at the same time it was an incredible opportunity to get up-close and personal with a 1953 DeHaviland Beaver that most individuals will never have. We admired the beauty of the aircraft and then started getting groups out a little after 12pm. Carl, Chuck and Ben had an adventurous spirit and waded a ½ mile down the shoreline to get into some un-fished waters. 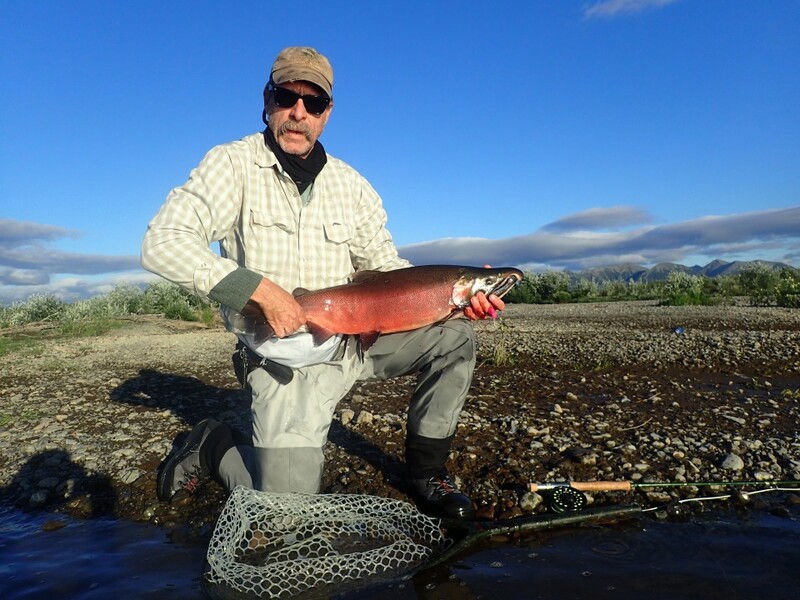 The streamer fishing for Sockeye was quite remarkable. Andy and Christine doubled up on nice char. 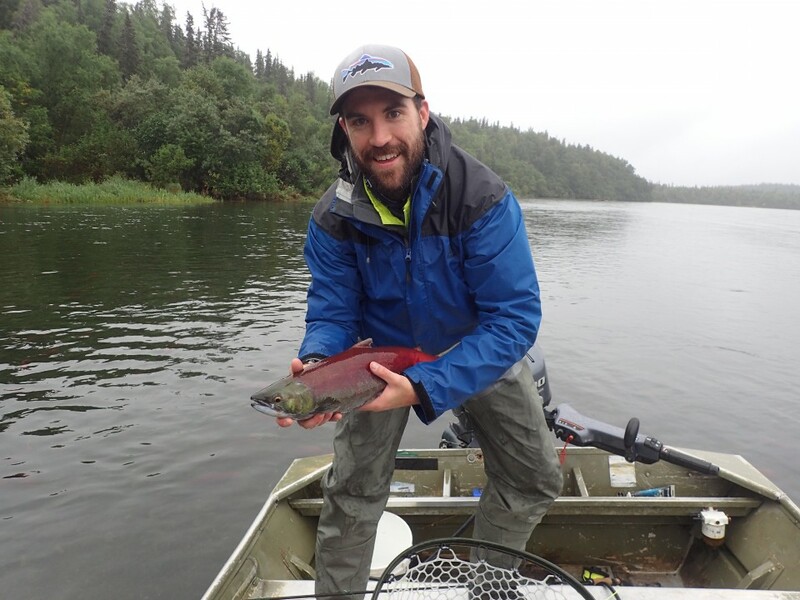 Ben put a hurt on the Sockeye while wading. Josh got a nice Sockeye and then showed off his skills as a talented net boy. 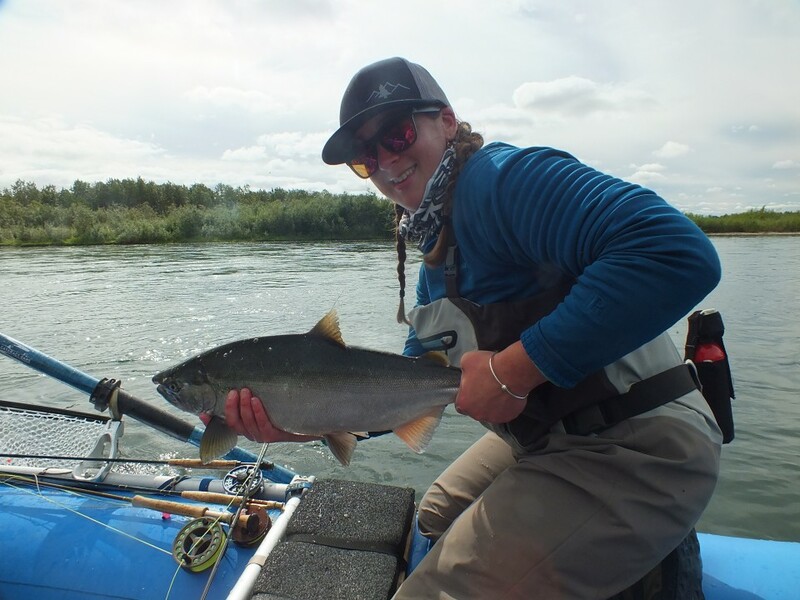 Carl wrapped up his day with a nice Sockeye that Bailey netted for him. As the day grew closer to the end the Romo’s had generously invited us to their home and we didn’t want to be late. As we were wrapping up we spotted a young Brown Bear fishing downstream. He saw us and wanted nothing to do with us and scampered back into the brush. We got out of our waders and walked over the Romo’s home. 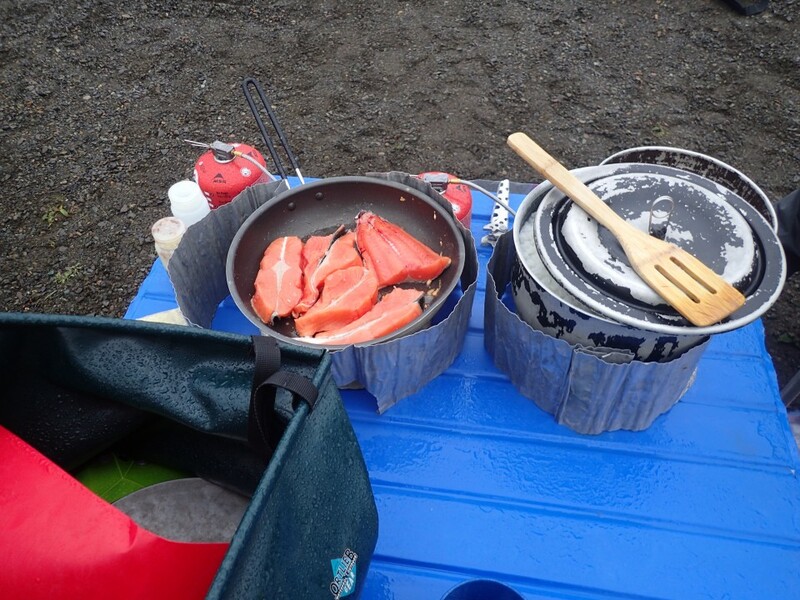 They cooked us a lovely meal of fish tacos and fish steaks all harvested from their local subsistence nets. It was a nice change of pace to get out of the Hangar and interact with some other folks. We walked back over to the Hangar while there was still light in the sky. A few guests stayed up and enjoyed a cocktail while others called it an early night. We woke up to a sky that was even foggier than the day prior and we knew nothing was happening early because the Beaver was still in the hangar. 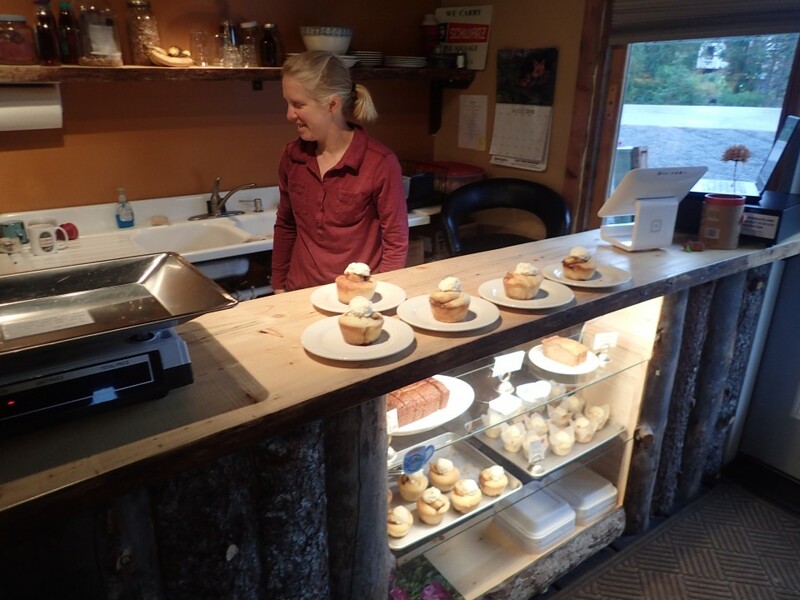 Guests had started a trend of going to the Romo’s for Coffee and a sweet treat as a mid-morning routine. Ben and Chuck hiked down to the river in the morning and Ben caught a nice Coho near the bridge. In the early afternoon Rick and Mike stopped by to pull the Beaver from the Hangar. The weather was still very soupy and we decided that it was the right call fish locally and hope for better conditions tomorrow. Andy put a hurt on Char and caught a nice Rainbow. Andy and Carl doubled and there’s just something so cool about a father/son double. Both Chuck and Christine showed their selflessness when fishing with their families. Neither angler felt the need to fish but simply wanted to watch others catch fish. Margaret and Michael doubled up on Char as well. Michael caught a very nice, blushed up Coho that we opted to release and hold out for something brighter. We didn’t realize that this task would prove more difficult then we had thought. Christine showed her strength and swift water wading safety with the help of Kevney and they caught several nice Char from the bank. As it got late in the day we thought we might need a protein supplement for dinner and launched a mission to fish the area where Chuck and Ben had caught Coho in the last 24 hours. 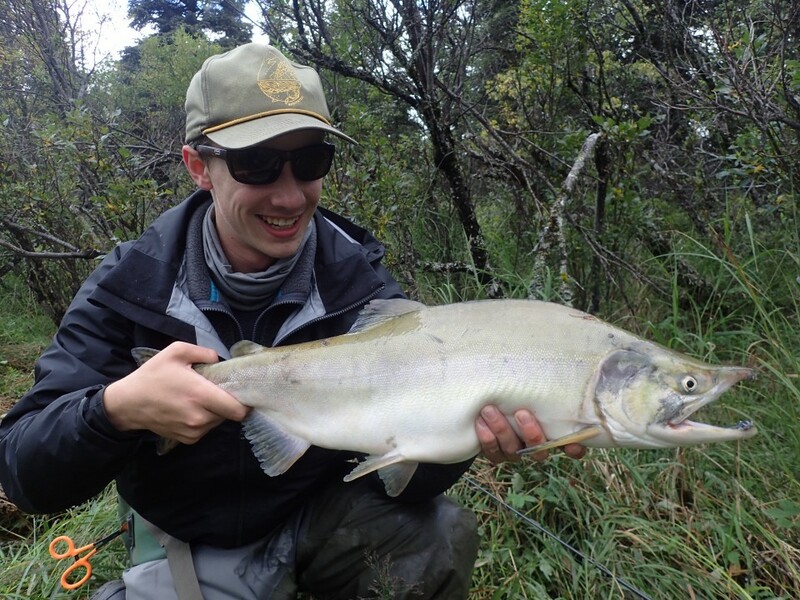 Andy caught a Coho salmon that turned into a Pink Salmon…which we discarded mid river after it showed its true identity. We went on the hunt for another Coho for dinner but the tide had turned and despite the best efforts of Chuck and Bailey, we were unable to find a fish for dinner. 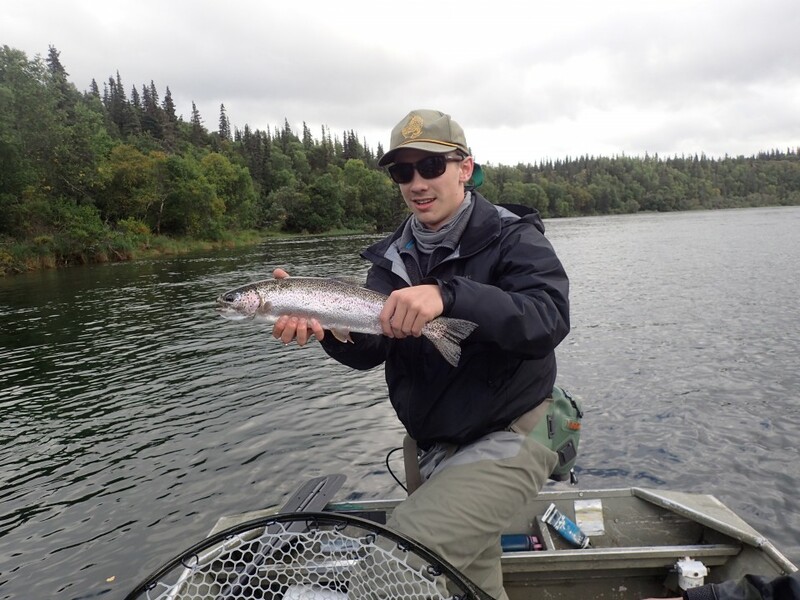 Even without the fish, we had gotten reports for decent weather the following morning and spirits were high. We decided to go big on pasta as fuel for the big day that hopefully lay ahead. Our decision to have pasta for dinner led to an event we refer to as: “The great pesto incident.” While squeezing pesto from a tube onto his plate, Michael’s sheer strength caused the pesto to jettison from the tube all over Brian’s fleece. Laughs were shared by all including Brian. We went to sleep with a forecast for decent flying weather tomorrow. 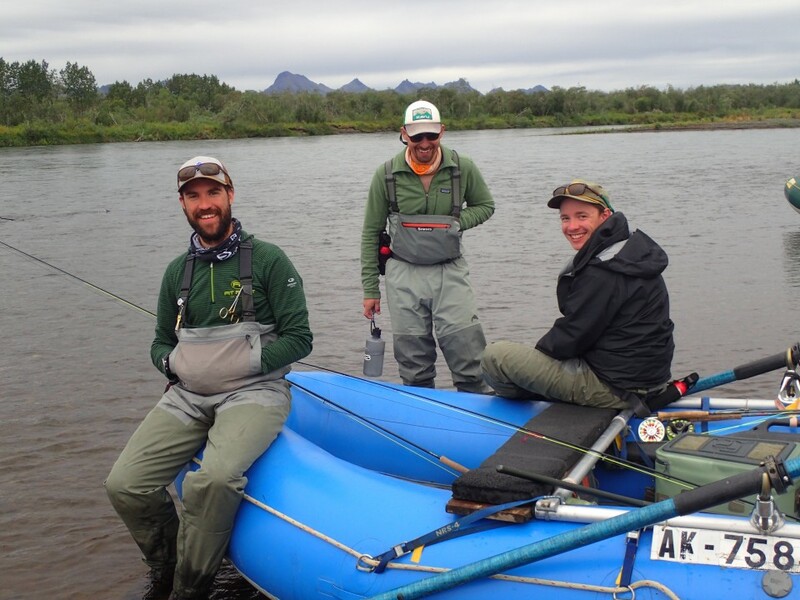 The weather improved and we landed on the Togiak River about 20 miles down from Togiak Lake. 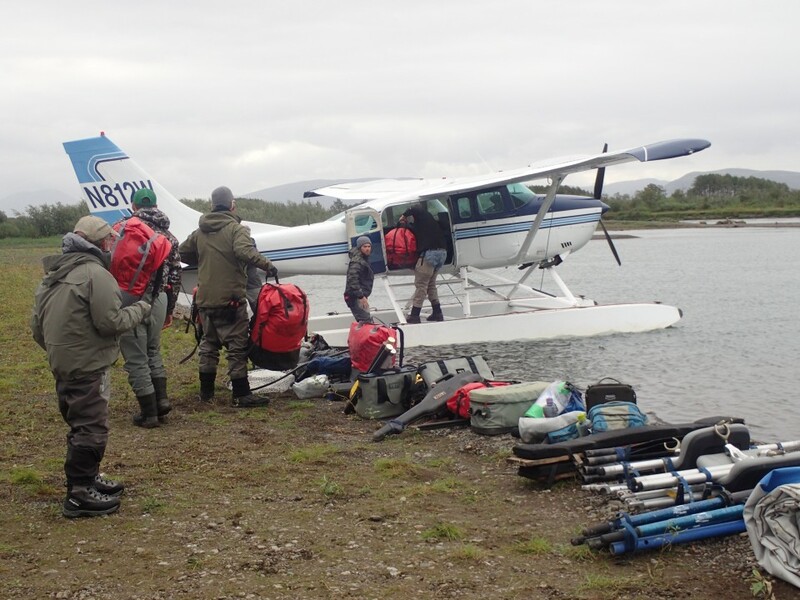 The guests were super psyched to be afield and operated as a cohesive unit while unloading the planes. The first loads arrived and we got rafts inflated. Everyone rigged a rod almost immediately and began fishing. Josh went to explore a side channel while a few others started fishing right where the planes had landed. 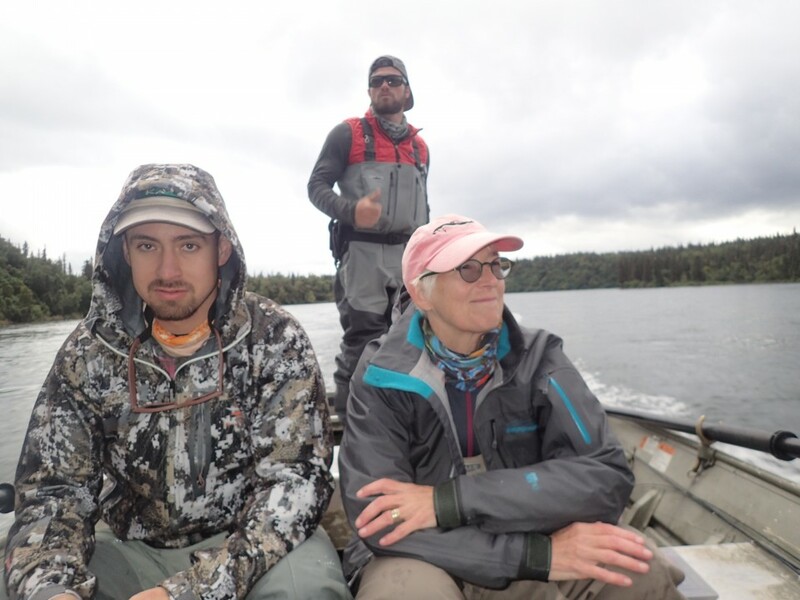 Margaret and Andy both started strong and hooked several Pink salmon in as many minutes. 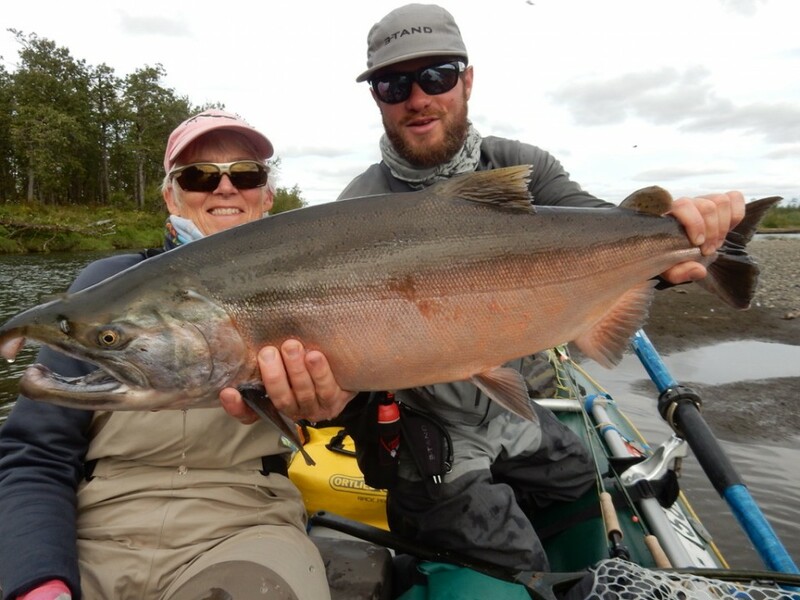 Margaret hooked a hot bright Coho salmon and we all so excited to be on the river at the height of the Coho run. 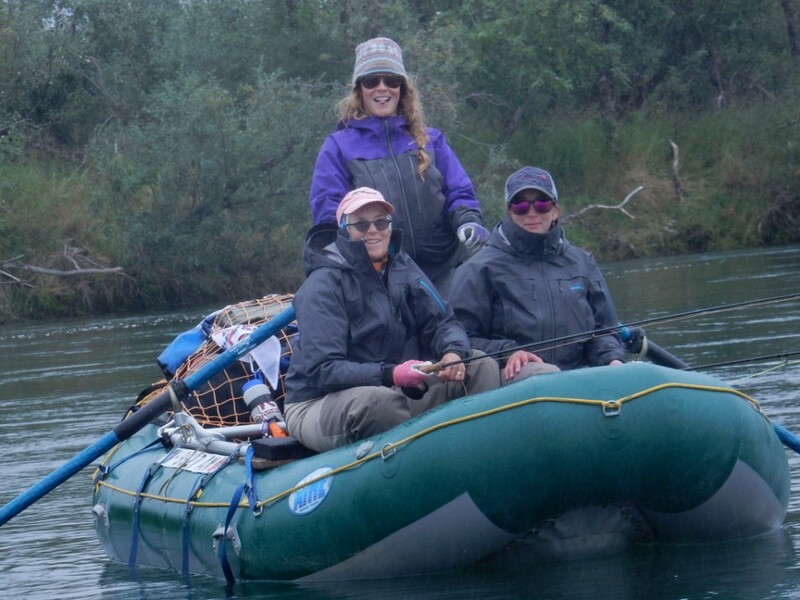 We got the rafts built and shoved off and then began to cast to great numbers of salmon. 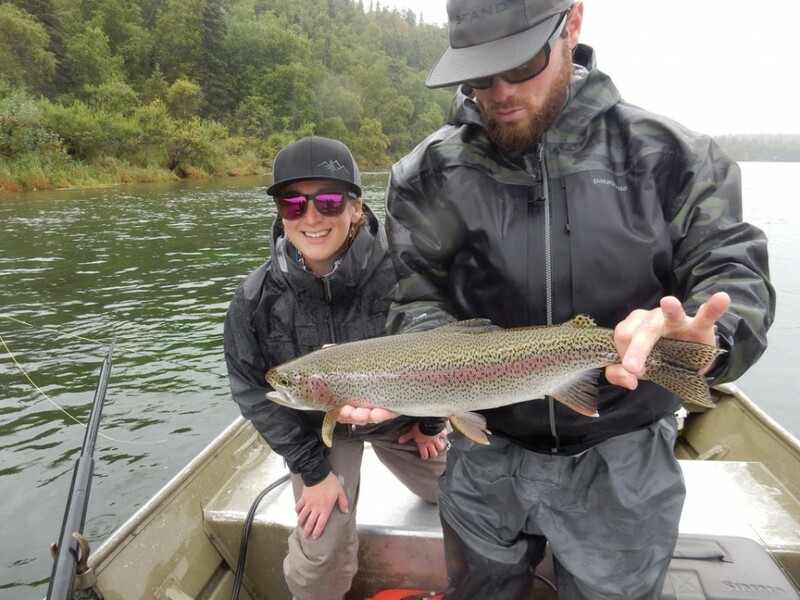 The water levels had dropped significantly from the week prior and the fish were holding in more traditional water that made it easier to target them. Chuck and Andy drew first blood on a double of 12 lb bucks. Margaret and Josh followed suit and pulled some nice fish out of the same hole. We passed the confluence of the Ongivinuk and the river split. Brian and Keveny’s boats both went left and John and Baileys boats went right. John and Bailey’s boats came into a slough that provided each angler with a fish on the first cast. 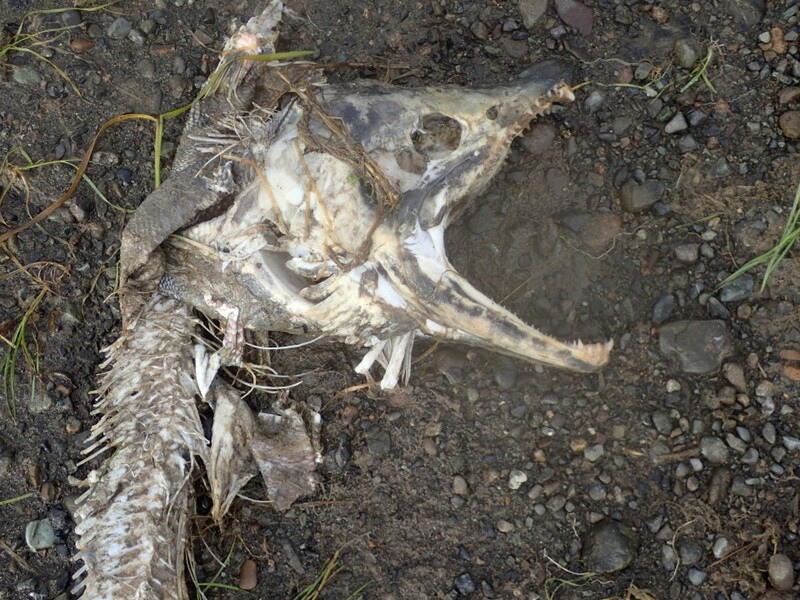 As the boats moved further into the slough, anglers saw something amazing, right out of a fantasy fishing tale. A pod of about 100 Coho were finning on the surface with the sun glistening off their black tails. The fishing in that pocket was absolutely mind-boggling. Andy caught an enormous Coho of about 17 lbs. 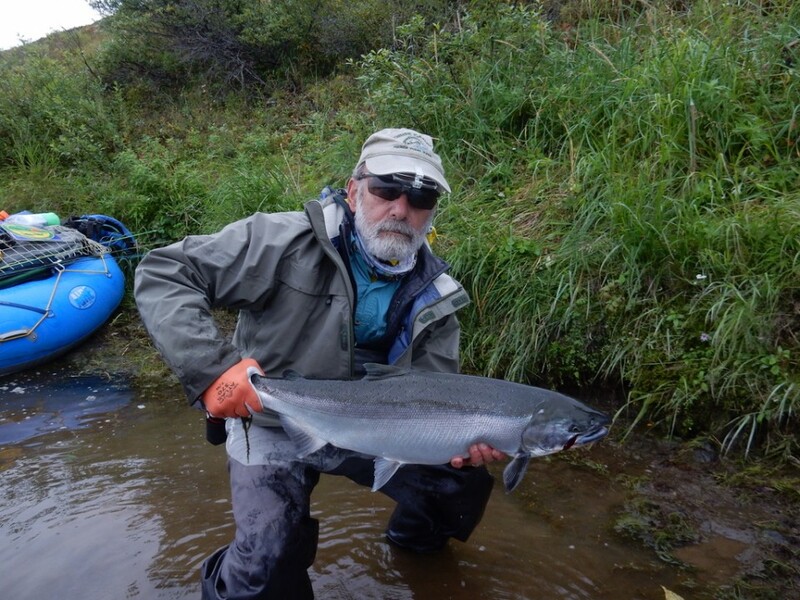 Eventually we had to move on but just as the boats were exiting that slough Chucks line came tight as he tussled with a 23” rainbow that he brought to the net and quickly released. We pushed our way down a bit, but every good-looking pocket we explored, held great numbers of fish. 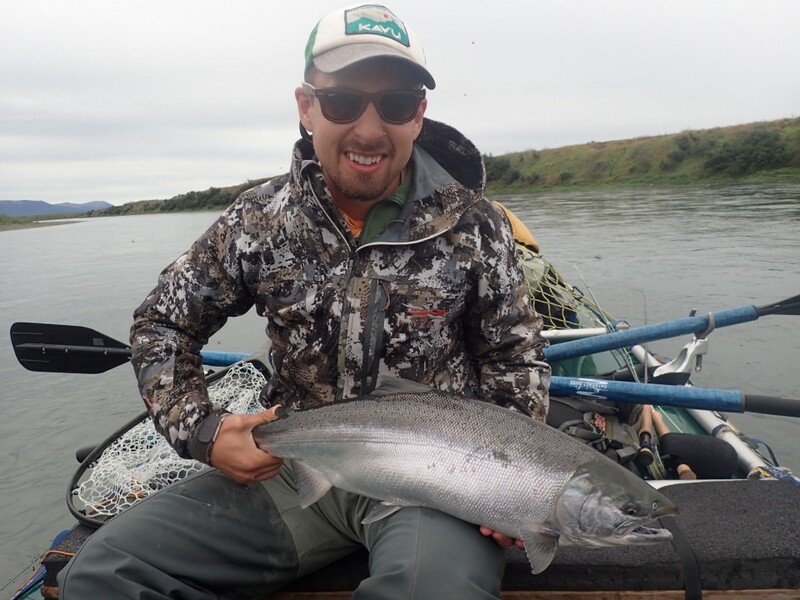 Kevney’s boat with Michael and Ben found a soft seam on the river left and they absolutely annihilated big fish. Carl and Christine weren’t far behind in Brian’s boat and hit the same seam with great success. We ended up pushing at the end of the day to make a couple miles and get camp up at a decent hour. 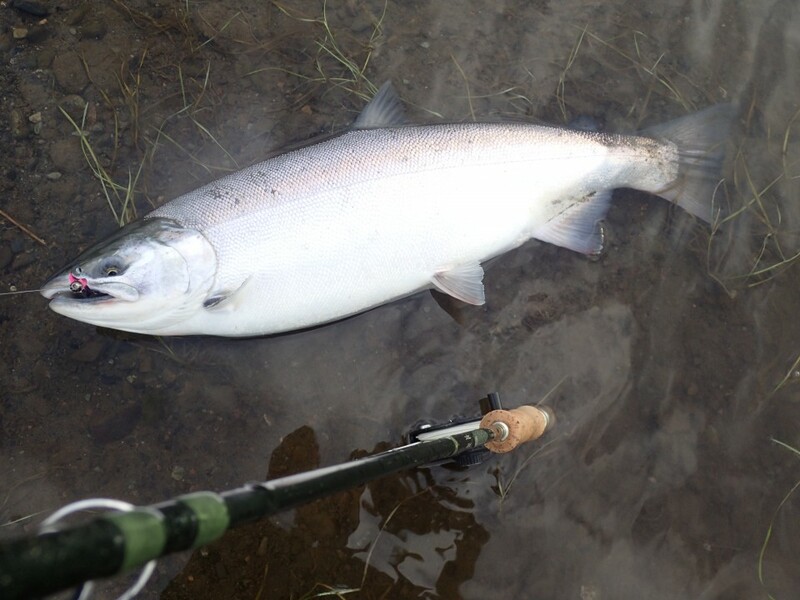 Coho were caught at the lower end of the bar in addition to good numbers of Pink salmon. The sun stayed high until late in the day and we enjoyed pizza for dinner. We congregated around the fire and roasted S’mores in the evening watching an absolutely spectacular moonrise. With sore arms, and full bellies, we wondered what tomorrow might hold? It was refreshing to wake up in the wilderness and get the Coffee water going with an autumn chill in the air from a clear starry night. We felt like we had accomplished something by simply persisting in the weather and finally arriving at this perfect place at the peak of the Coho run. 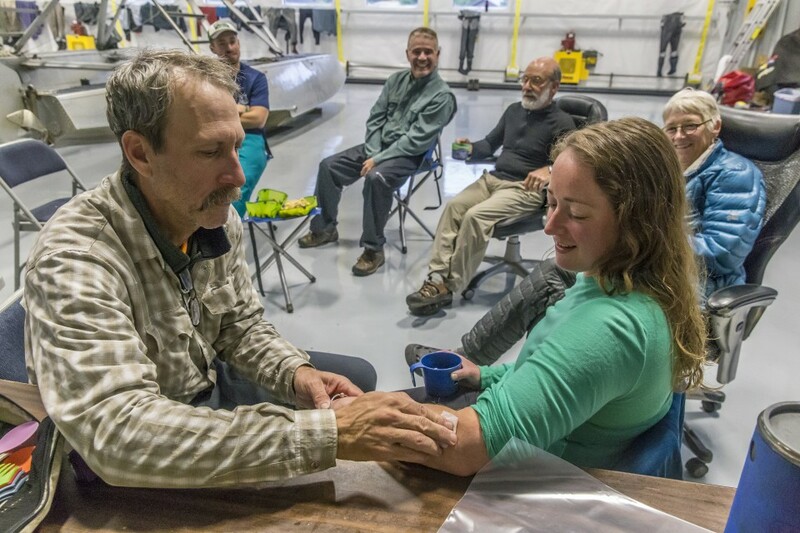 We had a good time while staying in an airplane hangar in Dillingham, and proved that we could form a team and work together in just a few short days. 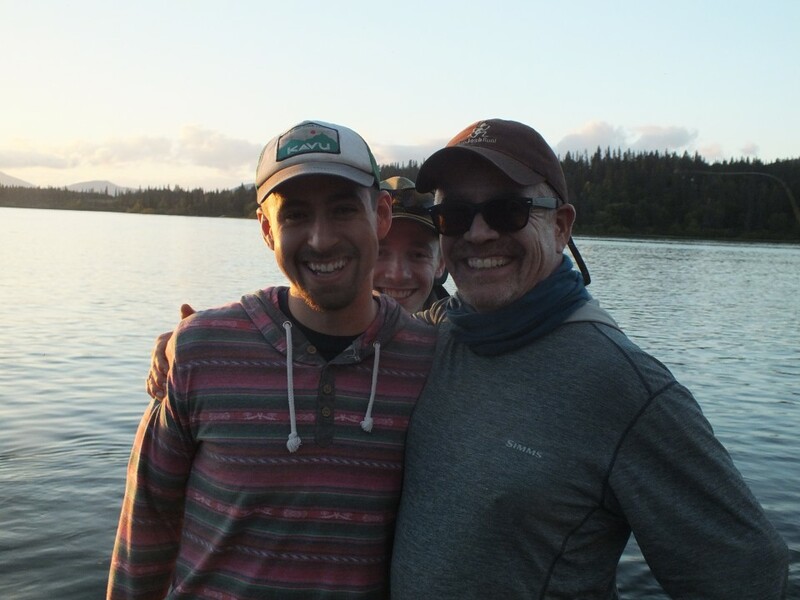 These wilderness raft trips attract people who are likeminded and typically get along pretty well, but being a part of the team while we’re in the field gives you a sense of family. We fish together, eat together, and camp together for the entire week. As we drank our coffee that morning and ate our breakfast, most of the guests and guides felt giddy like children. The fishing we experienced the day prior was incredible but it was just a taste, and these anglers were hungry. Indeed we were about to experience one of the most epic days of fishing of the season. The fishing was consistent and almost every boat doubled up at a high frequency. John, Michael and Christine worked down to a great looking slough, and just before they entered it, the drone of the distant floatplane became closer. It circled once before landing and then departed. Dropped off on shore, a familiar face. We rowed over to chat and there by coincidence was a guide buddy of John’s from Montana. Small world in big country. We stopped for Lunch at a creek that entered river right. There was a seam just on the edge of the soft water and the fast water where Ben, Josh, Michael and Christine all waded out. At one point all four anglers were hooked up at the same time. 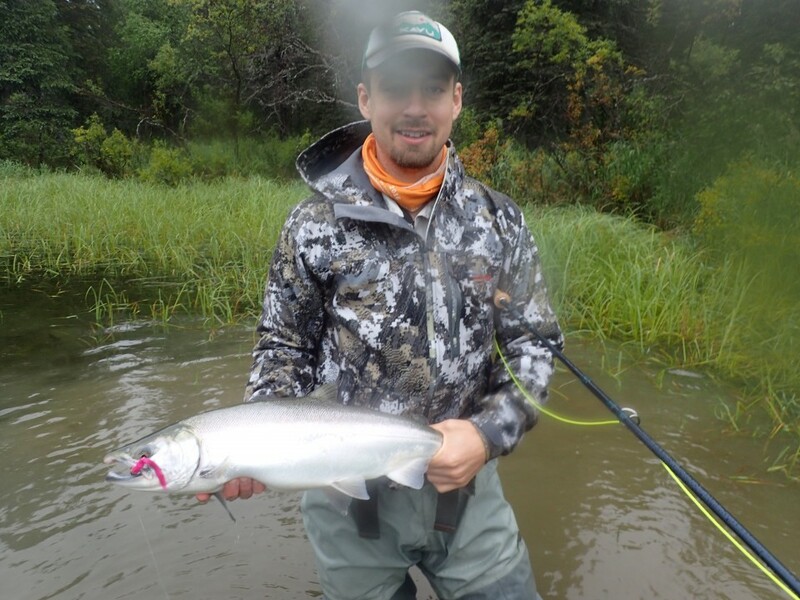 Kevney was guiding for his first week in Alaska as a fill in for Pete and had never caught a Coho before. Chuck selflessly called him over to a lower seam he was fishing solo and put Kevney onto his first Coho of his life and even netted the fish for him! This is a prime example of how there is truly no sense of mastery in Fly Fishing and everyone can improve. No guide is above being a student. The afternoon provided some of the most mind-blowing fishing that any of us had ever seen. Almost every boat doubled up regularly and one big river left seam had all four boats doubled up. 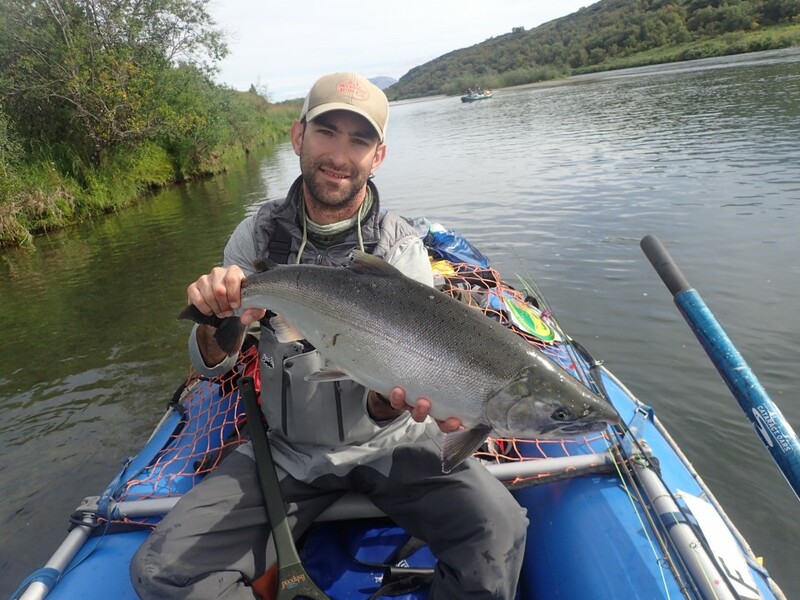 Andy was our first guest of the 2018 season to commit to top water and have great success with the pink Pollywog. Fishing with his Dad on Bailey’s boat, they caught 10 fish on the Wog alone. 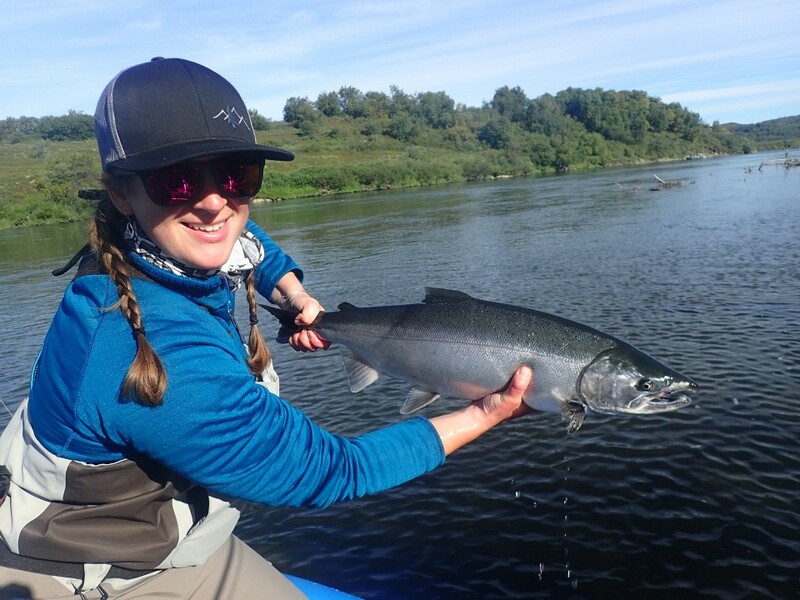 Fishing a small side channel that Bailey and John came into, Christine got into a battle with a true giant Coho. She landed the fish that was estimated in the 16-17lb range. It was tough to move too far without finding absolutely insane numbers of fish. John led us down a side channel that ended up being more stacked then anything we could imagine. Thousands of fish sat in this channel and every cast that was delivered was rewarded with a fish. This was the world-class fishery we had worked so hard to get to. 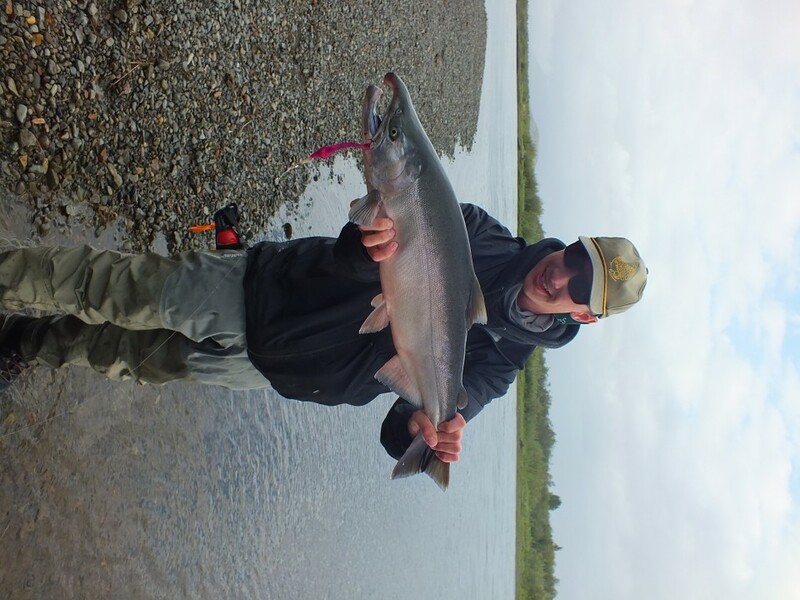 More Coho were caught on this day than any day of the season, and many anglers caught close to 40 fish each. It was a great day and guides and anglers alike where exhausted. 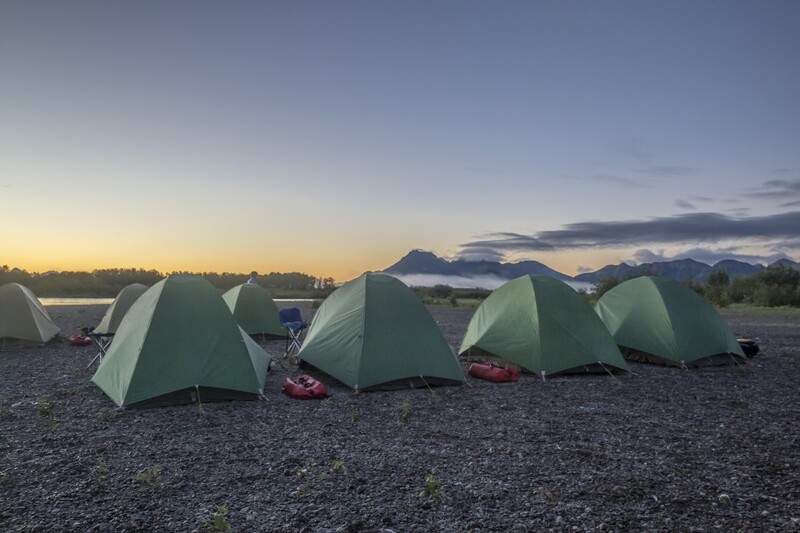 We fished our way down and made camp on an island in the middle of Coho country. As the sun got low the fish began to move and the bite turned off. John cooked up salmon curry for dinner and the rest of the group got a fire going in anticipation of S’mores for dessert. 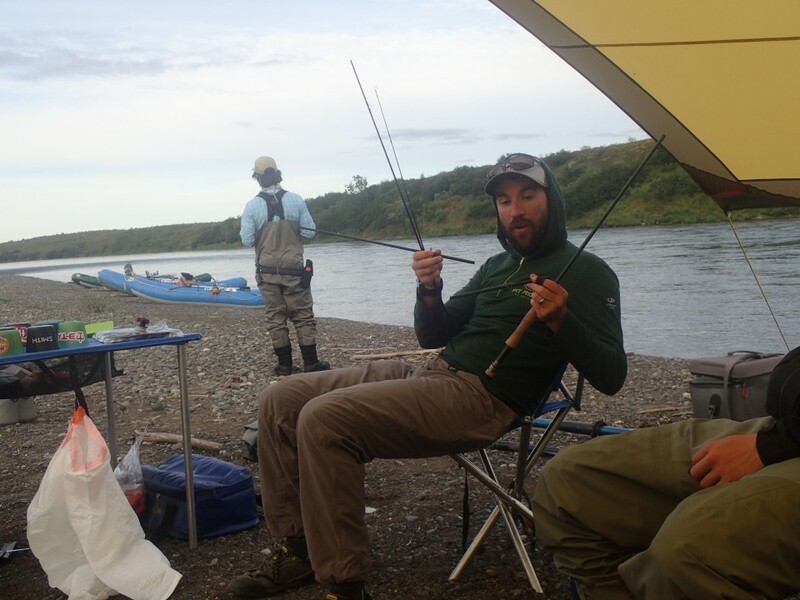 After an extraordinary day yesterday, everyone knew if would be tough to surpass, but the river was loaded with fish. We fueled up on coffee and got ready for our last full day. 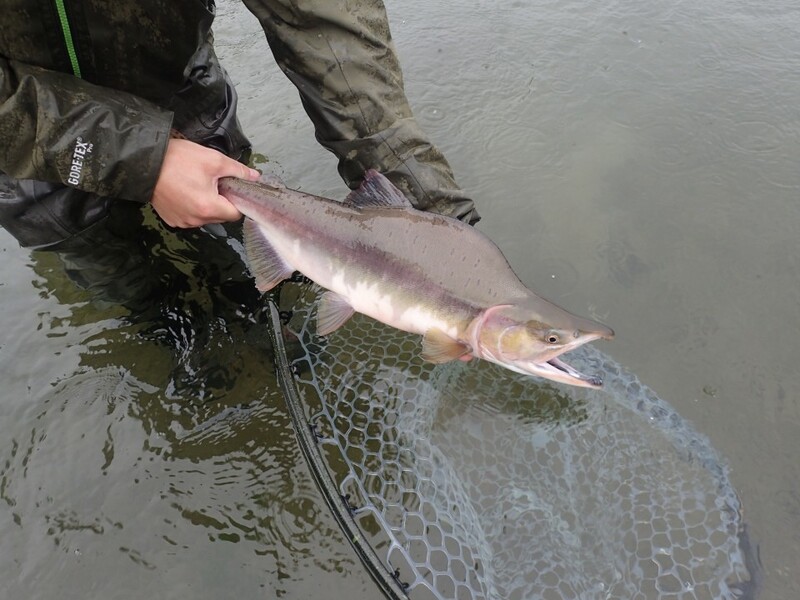 The river opened up, broadening ever wider and we found several seams that we fished with extraordinary results. The ladies boat was a forced to be reckoned with. With Bailey at the helm, Margaret and Christine had bent rods for the majority of the day. In one row around while fishing for Coho, Chuck caught a beautiful 23” rainbow and Josh took a 21” fish out of the same pocket. 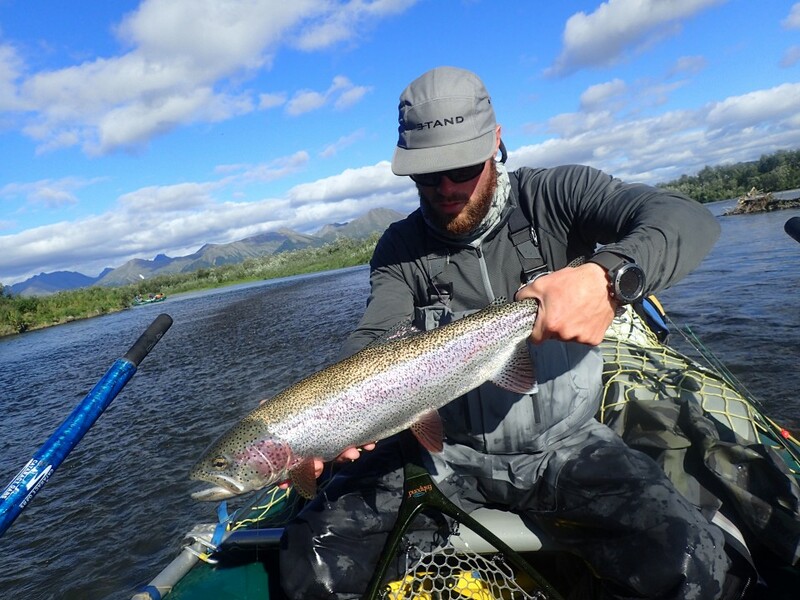 The Togiak is a river that is certainly known for its Rainbow Trout and their size. Michael also caught a nice rainbow of about 20”. It was nice to see some diversity amidst the hordes of Coho. 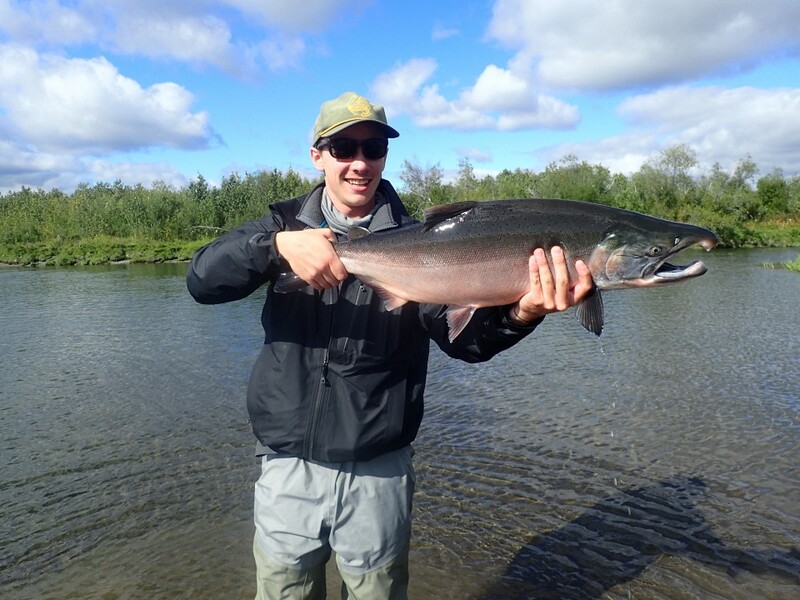 The fishing was still incredible but with the increased size of the river, they were holding in specific seams. When we did find them it was game on. We came into the confluence with a major tributary and everything around it was littered with fish. The fishing was so silly that some guides turned the oars over to the hands of seasoned and not so seasoned guests. 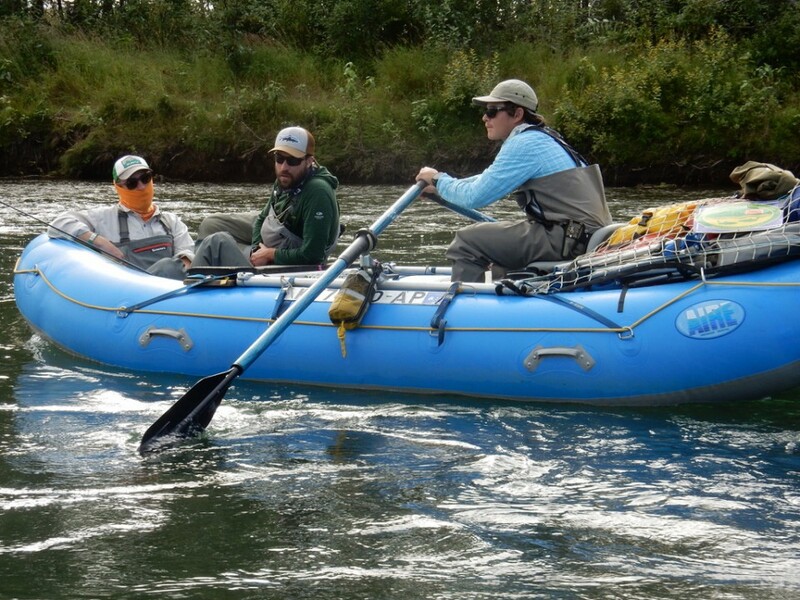 Josh rowed to put Kevney on some bright fish with Andy. Chuck rowed Johns boat for him and Ben. Double hookups ensued. As we took a break for lunch everyone’s minds were continuously blown. After lunch, a new goal was established; time to get some top-water fish. Ben and Chuck both took nice fish out of a big slough on Wogs. There’s nothing quite like it when you watch a fish push a hard V wake before a set of jaws punches through the surface and engulfs your fly. If that doesn’t get you fired up, you better check your pulse. Brian rowed for Michael and got him on a beautiful Wog fish in the same slough. Meanwhile in the lower portion of the slough the girls boat was absolutely crushing big fish after big fish. The action didn’t slow and doubles upon doubles added to the chaos as anglers and guides dived, spun, and contorted to put big fish in the net. John had an aching desire to catch a Wog fish and Ben wanted to make it happen for him. He rowed him onto an absolutely perfect eat that resulted in satisfaction for all. 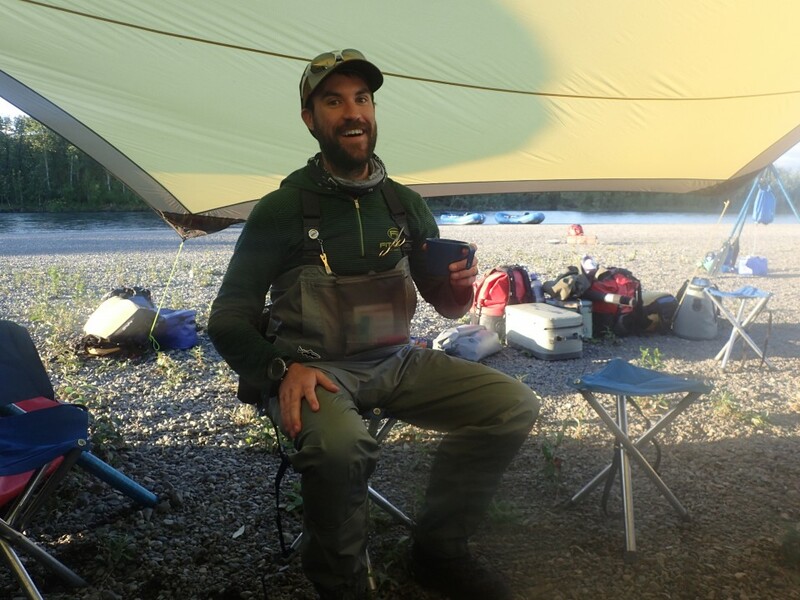 We made our way down to camp, fishing all the way with constantly bent rods and smiles on everyone’s faces. 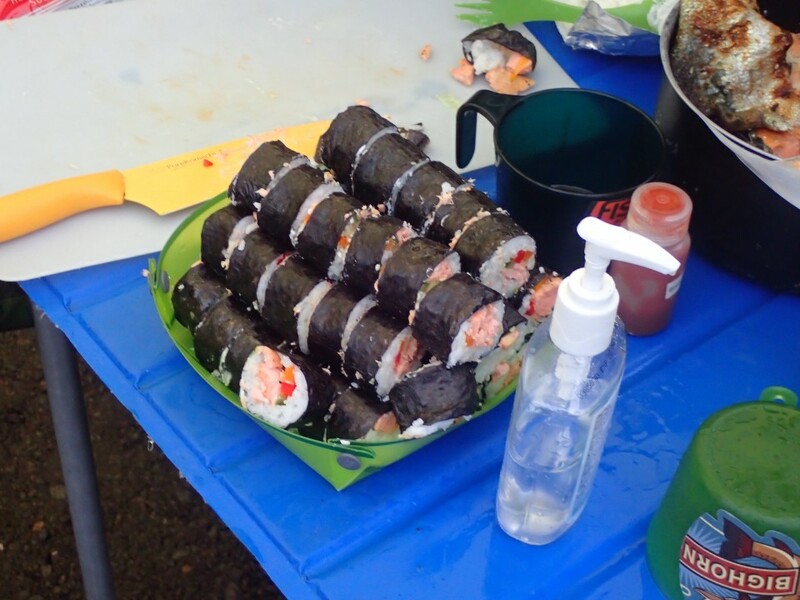 As Brian filleted the fish and prepared the sushi, the rest of the guides set up camp while the guests continued to catch fish. 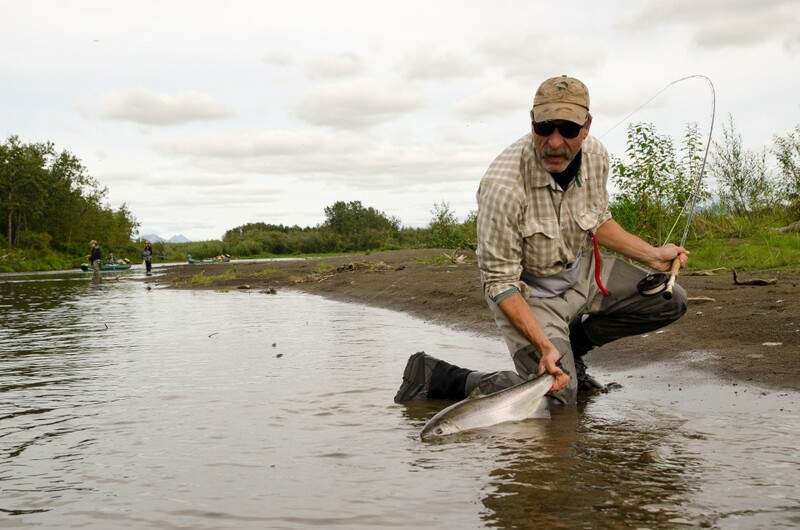 Chuck captained a mission across the river to get into a tasty looking slough that brought a few more fish to hand for the guests. We enjoyed Coho Sushi and many went back out for last licks on fish after dinner. The last day of the trip and indeed of our season always carries a level of sadness with it. 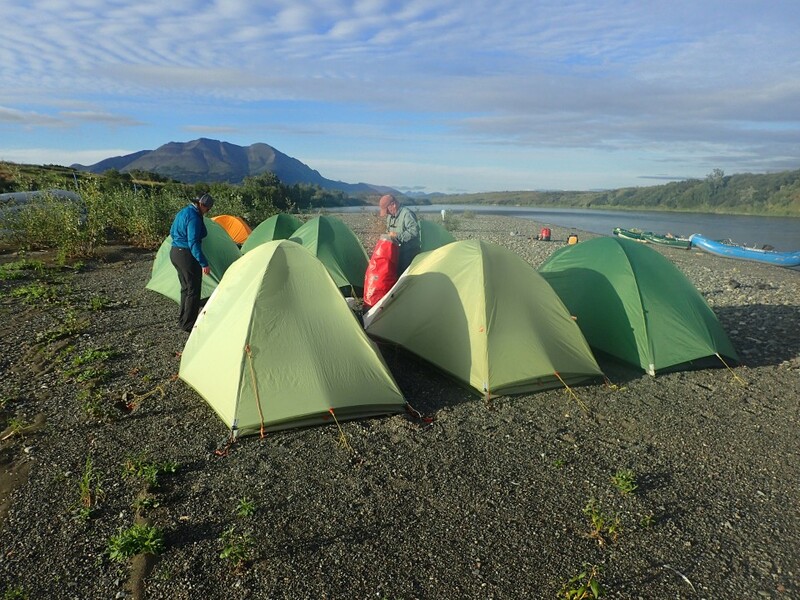 The weather was a bit iffy in the morning and after breakfast the guide staff debated breaking down camp. It was uncertain if the group would be able to get picked up. We touched base with the pilots and we were meant to have a weather window in the afternoon. The entire group was still hungry for fish and continued to catch fish until we decided to make the move down to the landing zone. It was still uncertain if we would be picked up or not. We had a call to our pilot’s wife and heard that the fog got low and our floatplanes were forced to land on a lake halfway to Dillingham. 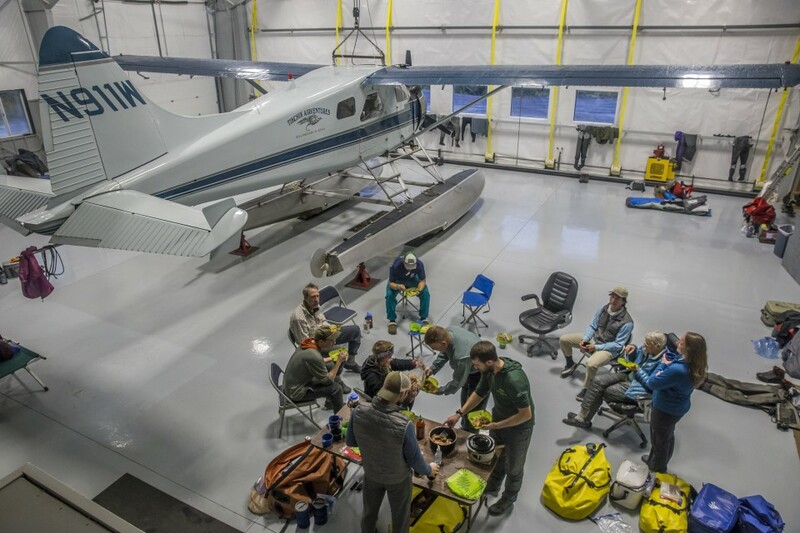 Everyone was mentally prepared for whatever the weather dictated but we hoped we would be able to get people out who needed to make their evening flights. Margaret fished the LZ bar and pulled another nice Coho out. Others broke down their rods, satiated with their success. In the late afternoon, both planes were able to make it to us. We loaded them up with all the guests and Brian and a little gear. 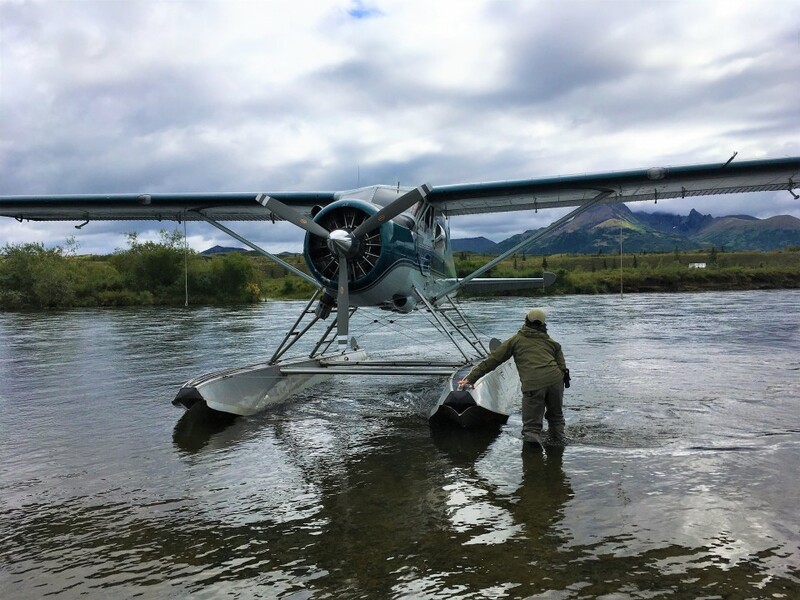 We knew the likelihood of the aircraft returning to the river for another pickup was low and getting the guests out safely is always the priority. 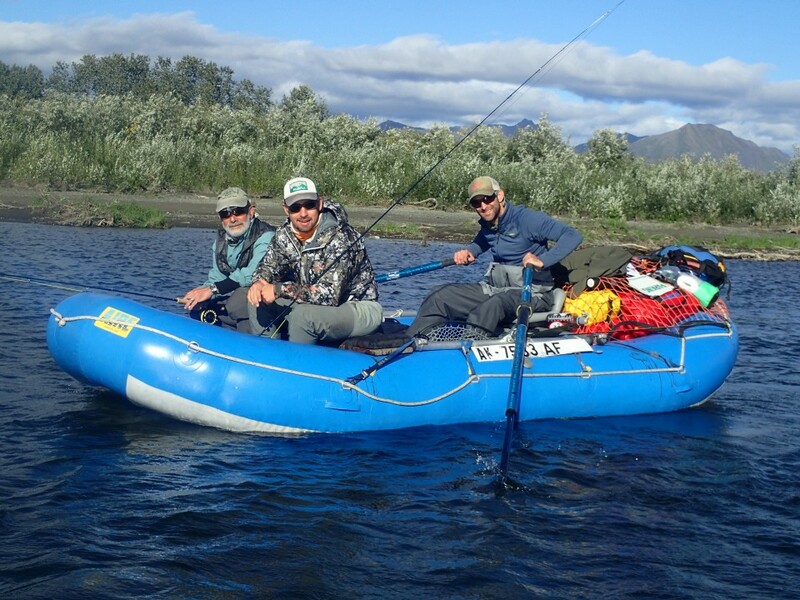 We loaded them up and John, Bailey, and Kevney prepared for a night on the river. The staff returned safely to Dillingham by 2pm the following afternoon, just in time to see the Mangus/Garcia/Fuller group off at the airport. 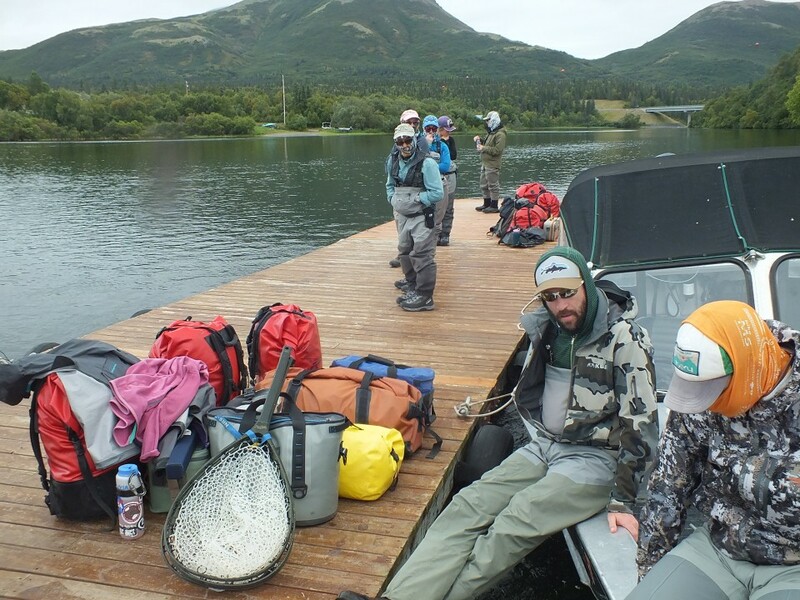 The fishing and company was simply world class, and the Alaskan weather showed its power and we granted it respect. It was a fitting cap off to the 2018 season with some best quality and quantity of Coho fishing we have ever seen.